Very Rare Twin Diesels and in Exceptional Shape for it's age. Come see for yourself! Fresh Water, Lake Erie boat until 2014. Seller brought the boat down through the Great Lakes and the Mississippi himself. This boat features twin Volvo Diesel engines, is in very nice shape and priced to sell quickly. Do not miss out!! Contact us today! A lot of Wow Factors are involved with this boat. The seller(s) have kept her in very good shape. She was recently detailed inside and out. She also features rare Twin Diesel engines which at the time of this listing is the only 410 Commander on the market With Preferred and Upgraded Twin Diesel Engines rather than the Standard gas Engines. All Exterior Cushions and Canvas for the Bridge are stored inside and under Air Conditioning and in like new condition. All other Canvas and Strata Glass is in Very Good Condition. The interior is roomy and clean with more than ample sleeping accommodations. 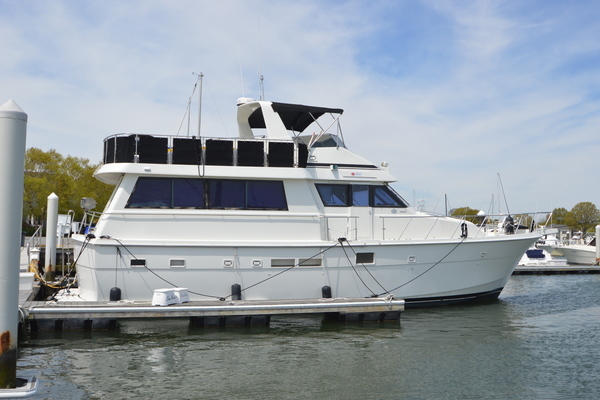 This boat will make an excellent Live Aboard, and the asking price is below market value. The Current owners bought this boat about 4 Years ago on Lake Erie and brought it down themselves, so she would also make a very good Great Looper. When they purchased the boat, they knew exactly what they wanted and looking at a dozen 410's all over the eastern half of the U.S.A. This was the best on the market then, AND they have taken great care of her. others not so good. Big-block 350hp gas engines were standard. *Rear Deck Upholstery and Strata Glass All in Excellent Condition.